Opinion: Buy an iPhone this holiday season? So, have you finished your Christmas shopping yet? What? You haven’t started? Get out there . Don’t you realize that time is running out, even as you’re reading this? If you wait too long, there might not be any presents left to buy . Think of the pain, the suffering: you’ll just have to buy socks for everybody. And thus I fulfill my contractual obligation to whip the populace into a panic over something insignificant every once in a while. Good times. This week on the ‘box, we’ve got a shocking surprise for would-be car thieves, an anti-eavesdropping pen, and some cheaper configurations of the fabled Optimus keyboard (though really, why bother?). At least two cars on my street were broken into last month; neither were mine, as luck would have it, but after my own car was broken into several years ago, I’ve tried to not take chances. I don’t leave anything in my car overnight and I’ve cleverly disguised my Aston Martin DB7 as a 1997 Honda Accord. Tricky, right? But what about the other end of the equation: what if someone breaks into my house and takes my keys ? 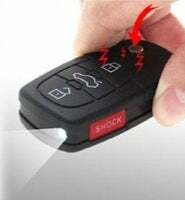 It’s a risk, but one you don’t need to take if you invest $51 in the Shock Car Key. You see it’s not a key at all, but an electroshock device . Anyone who tries to start your car with this sucker is just bound for a (very small) world of pain. Plus it’s a great way at practicing aversion therapy on your teenager who keeps trying to borrow the car on Saturday night. If there’s one weakness this hilarious gadget has, it’s probably the fact that it has the word “SHOCK” written in large white letters on one side. Of course, if you use it, as suggested by the catalog copy, “down in the bar,” I’m sure your friends targets will never even notice. Shhhh . I don’t want to say too much, because I think we’re being watched. And listened to. And even, if I’m not mistaken, smelled . That’s right; they’re, er, smelldropping on us. I’m taking an awful risk even writing about this, but that’s why I packed my Auto Detective Pen. 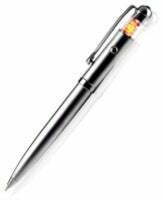 If there’s a wireless camera or microphone around—and if it’s broadcasting on the 900, 1200, 1300, 2600, or 3000 MHz frequency—my handy-dandy pen will know and clue me in with its blinking LED lights. There’s also a UV light just in case I want to check the money that I, um, sometimes get for services rendered. Plus, there’s this hula girl and when you turn the pen upside down—but never mind that now. Hey, this thing was a deal at just $16 and it comes with batteries included. Did I mention that you even use it to write notes or a grocery list? Yeah, it does everything . We’ve been waiting, and waiting, and waiting—and waiting some more for the eventual release of the Optimus Maximus, the fabled keyboard that will bring peace and prosperity to this world. For verily, it is said that on that day the PC user will declare a truce with the Mac user, and all will live in harmony—except for those Linux guys. Nobody likes them anyway. But in case you don’t feel like dropping the full $1,564 price on the 113-key OLED keyboard, Art Lebedev and his team of industrial design goblins gurus have whipped up three alternatives. You can get all the number letter keys with OLED displays (that’s 47 keys) for $999, or the 10 function keys on the left for $599; or just the spacebar for $462. Wait, why the heck would I want an OLED display on just my spacebar? Hey look, if I switch the keyboard layout to Cyrillic or Arabic… it’s still a spacebar . And, more to the point, how could it possibly be worth a $362 premium over the most expensive keyboard I would ever envision buying? Go big or go home, I say. The keyboards are due to come out next February, and pre-orders are currently being accepted, should you have more money than you know what do with (a suggestion: charity is always a good bet this time of year). That’s all the gadget we can spare time for this week, but rest assured, we’ll back next week. In the meantime: buy buy buy .